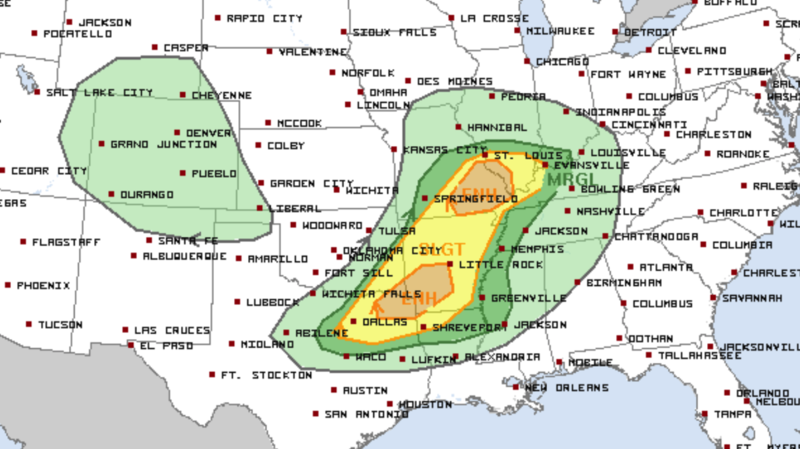 Severe thunderstorms are expected from north Texas to southern Missouri and southwestern Illinois, mainly offering hail and damaging gusts. Morning water vapor loop shows a progressive upper low over southeast NE, with an associated mid-level speed max over KS/OK. This feature will track eastward today into the middle MS Valley, providing increasing ascent and deep-layer vertical shear for thunderstorm development/organization. Visible imagery shows substantial clearing/heating is occurring across southern MO and southwest IL, where surface dewpoints are rising into the 50s and low level lapse rates are steepening. 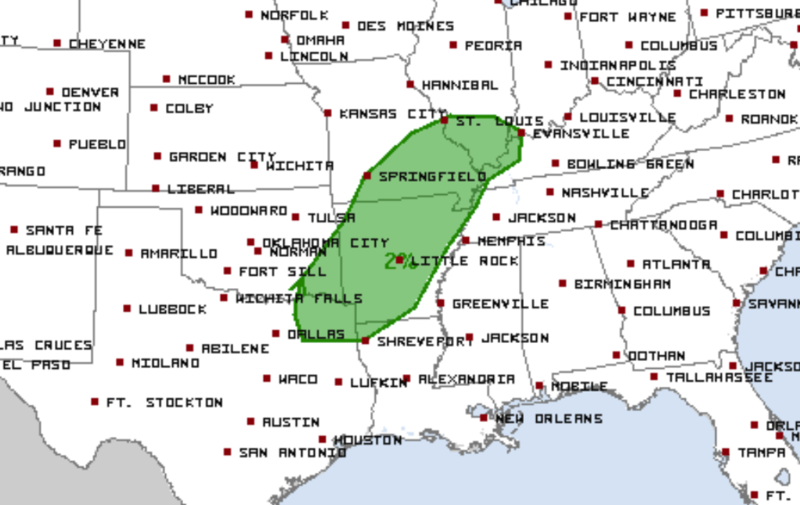 This should aid in the development of scattered thunderstorms by mid-afternoon across southern MO. Forecast soundings show shear profiles favorable for discrete supercells capable of large hail. The tornado risk will be limited by veering low level winds and rather low dewpoint values. 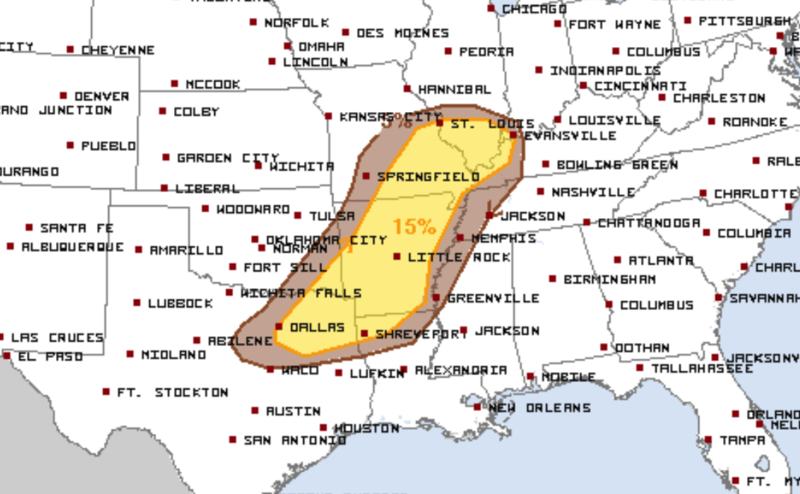 However, the damaging wind threat should increase as storms track eastward into southern IL during the late afternoon. Have added an ENH risk area for hail coverage across parts of southeast MO and southwest IL, where 12z CAM solutions provide greatest confidence. Latest surface analysis shows a weak warm front extending from southeast OK into southern AR. The air mass south of this front is relatively moist and moderately unstable with dewpoints near 60F. Models are consistent in the development of scattered intense storms this afternoon, with supercells capable of hail expected. 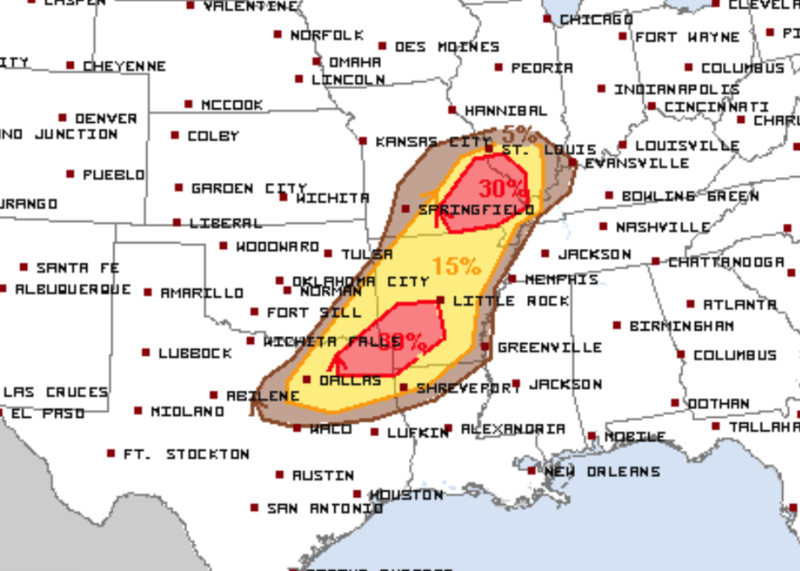 This activity is likely to organize into a more linear structure through the evening, but continue to pose a risk of hail along with locally damaging winds. Activity may remain strong well into the night, affecting southeast AR/northeast LA and western MS. Similar to northern area, parameters and confidence support inclusion of ENH risk area for afternoon/evening hail risk.